A superhero film that is bereft of anything that could justifiably be described as super, A Flying Jatt is a big bird without wings. It never quite takes off. Lead actor Tiger Shroff dances and moves pretty well. It is in the acting department that he falls way short of the intensity needed to make the titular character work. A Flying Jatt, directed by co-screenwriter and choreographer Remo D’Souza, plays out like an overlong, utterly monotonous public service advert aimed at spreading awareness about the need to protect the environment. Indeed, there is a message dovetailed into this chaotic and unremarkable good versus evil narrative. The slovenly screenplay seeks to blend doses of epic-scale heroism with dashes of earthy humour. The film does not strike the right notes on either score. A young drifter, Aman Dhillon (Tiger Shroff), is drawn into a bloody confrontation with an industrialist (Kay Kay Menon) and his English-spouting superhuman accomplice Raka (WWE wrestler Nathan Jones) when his hard-drinking, tough-talking mother (Amrita Singh) opposes a nefarious plan to take over a patch of land and cut down a tree revered by the people. 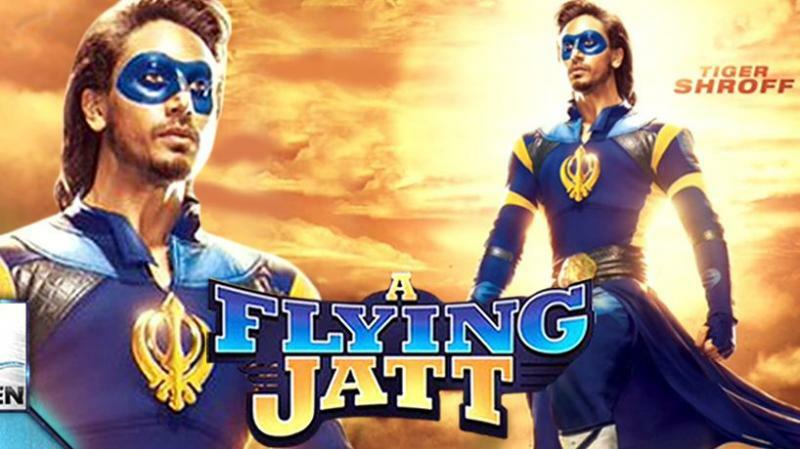 A Flying Jatt is a trite tale about a boy who, thanks to divine intervention, acquires invisible wings and a shield of invincibility and then goes out into the world to rid it of its malcontents. Everything in the film is presented absolutely literally, so there is no scope of anything at all being left to the imagination of the audience. So, in one scene, we see the hero wiping the cobwebs off the walls of his home. His mom exhorts him to something for the common good. Go clean up the city, she says. His mother's diktat is his inspiration and he takes to the air to give Raka a run for his money – well, by the latter's own admission, it isn't money that he is after; he lives off the noxious and dark fumes that a modern city generates. And that is the force of darkness that the intrepid and insuperable protagonist has to contend with as he goes about putting things around him in order. Of course, he has a hell of a fight on his hands and it is presented in a manner so overheated that it becomes impossible for the audience to be genuinely invested in its outcome. The members of the cast ham it up without a care in the world. Even Kay Kay Menon, otherwise a fine actor by all reckoning, ends up looking like a sorry, simpering caricature of a villain. Amrita Singh, seen on the screen after a long hiatus, adds to the cacophony by hollering uncontrollably at everyone within earshot. The worst spectacle is offered by Jacqueline Fernandes, playing a giggly girl who goes all aflutter every time she is in the presence of the flying superhero. If this isn't rank bad acting, nothing else is. A Flying Jatt is a film that obviously wants to fly. But saddled with an actor whose limitations are all too obvious and a shoddy script, it can only limp along without much purpose or direction.